Evil is of two kinds, moral and physical. 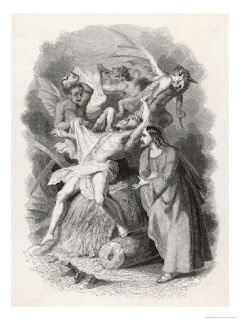 The Lord expels the demons by force of His Divine power and thus frees the suffering one from this oppression. Worse than physical evil is the moral evil whereby man misuses the gift of free will and chooses to disobey God. This evil we call sin. Christ is anointed, He is "the Holy One" in whom the holiness of God is found in its fullness, for He is "anointed with the Holy Spirit and with power". He is man's only hope in the struggle against evil. In Him only are we made holy through His power to cast out evil. Young People Stand Up for Life! Photos by MCITL of the Youth Rally and Mass at Verizon Center in Washington, DC, on Thursday, 22 January 2009. Kudos to Msgr. Joseph Schaedel for his witty letter to his parishioners! I laughed out loud when he encouraged us to go get therapy if we were upset the Sign of Peace was omitted. Quite the opposite for me a couple of years ago, I was needing therapy when a local priest MADE us cross the center aisle and hold hands with everyone during the sign of peace. LOL. Father Cusick, I just found your blog and found it refreshing. Keep up the good work. Thank you, Laura, for visiting and please do so often. Our readers are welcome to send comments and questions anytime to: mcitl DOT blogspot DOT com AT gmail DOT com. "Repent and believe in the gospel" of life! Choose Life! Images from the 2009 March for Life, Washington, DC. 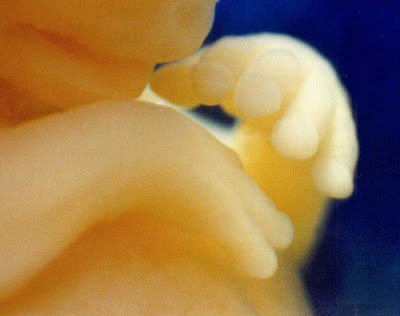 For more info about the US Bishops' postcard campaign to defeat passage of the Freedom of Choice (to kill) Act, please visit the website for the National Campaign for a Human Life Amendment. There you can download and print postcards to send to your Representatives and Senators in Washington, DC. Names and addresses of your representatives to the US Congress can usually be found in the front section of the latest edition of your local phone book. Thank you for inaugurating the Kingdom of Christ by being agents of the Gospel of Life! Celebrate the Inauguration: "The kingdom is at hand"
In our liturgical life this Sunday we celebrate the "inauguration" - of the Kingdom. 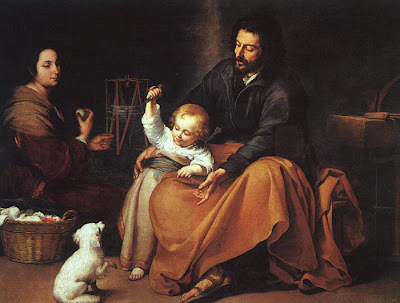 The constant work, "leitourgos", which Christ has ordained for the Church is the liturgy. This work makes the kingdom present for the renewal and conversion of Christians and of all mankind. Please pray today for all who "March for Life" in Washington, D.C., and elsewhere around our nation, that their efforts may lead to a day soon when every human life will be protected as sacred, made by God in His image and likeness, from the moment of conception until natural death, in all its stages and conditions. 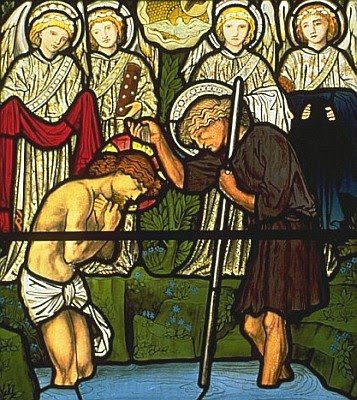 John the Baptist cries out to us: "Behold the Lamb". He calls us to commit ourselves to the Gospel, making disciples by spreading his message to those who can hear us. The Church teaches that the faithful cannot be silenced, that the impulse to spread the Gospel, to proclaim Christ as Messiah, is not an option but, rather, an obligation. The Church is not "catholic", not universal, if the Church is not also missionary. 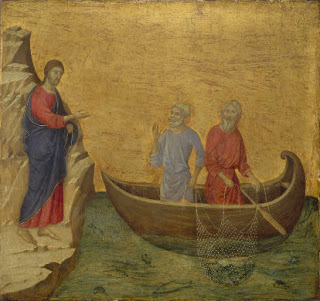 Meeting Christ in the Liturgy offers a reflection for the Second Sunday in Ordinary Time. 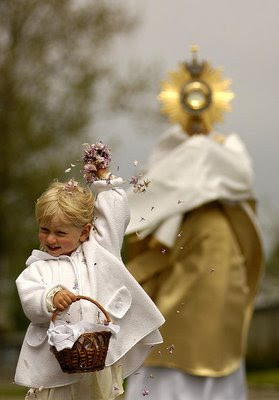 2 Cor 2: 14: "the fragrance of Christ"
flooding in smile the face of a child. erasing distance, space and time. across the globe from clime to clime. forward in joy with her. 1. He won't use the Bible. 2. He won't mention Christ. Gene - I can't top that: you said it best. I'll say nothing at all. A Pope who knows "how to Pope". I am a 10 year old boy and I leave (sic) in Italy. I have been praying for you since my father told me about your tumor. On January 7th I could not fall asleep because I was praying for you. I hope you can be cured in the best possible way. I am your friend even if you do not know me. ...is not like the others. The holy Gospel according to Saint Luke 5:12-16. 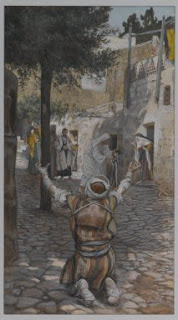 The leper was made clean because he entered into a living conversation with the Lord, engaged in heart, mind and voice with the living presence of the Divine Person Jesus Christ, Incarnate God, the source of life and healing. In the Liturgy of the Word, "proclamation is primary". Putting aside distractions, we are called to be present in the same way as the leper was to the Lord who heals us of the alienation of sin, the loss of His presence through grace. This we are able to walk away from our encounter with Him, as the leper did, rejoicing and proclaiming His Name and His presence, in the world and in us, through the grace of the Eucharist. "I must only ask God to conform my will to His"
Please pray today for Phil Johnson as he undergoes surgery in Virginia. He offers an update on his blog, In Caritate Non Ficta. This is my hope for you now and forever. 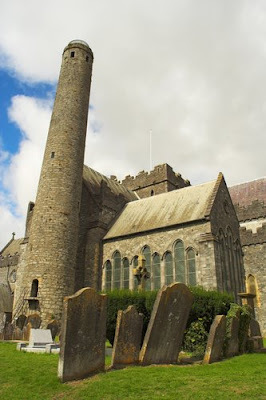 -- anonymous Irish blessing read today in Saint Peter's chapel at memorial Mass for Father Canice Treacy, b. 14 May 1928, d. 06 Jan 2003, Ordained 08 Jun 1952. RBRown: Your comment is the religious version of: I’ve invested all my money with Bernie Madoff. Thanks to Fr Z at WDTPRS for this item from the combox at his blog and for his clarification on the subject discussed in the above repartee: "Let us all keep firmly in mind that the Church cannot and will not ever ordain women. Those who cling to this idea are deluding themselves. Those who push the agenda are harming the Church and endangering their souls and those of others." Readers are invited to visit Breviarium Romanum to view photos of the Extraordinary Form celebration of the liturgy for the Feast of Saint John the Apostle this New Year aboard the US Navy aircraft carrier USS THEODORE ROOSEVELT (CVN-71). The following is from a bulletin in Indiana. How refreshing to be reminded of the truth, and of the liturgical sanity of Holy Mother Church sometimes so sorely lacking in many places. Some people have asked me about the Sign of Peace. They note that in most cases we omit the line, 'Let us offer each other the Sign of Peace … ' during Masses in the Ordinary Form. Dozens of people have thanked for me this. One person inquired as to why. No one complained. And, the fact is that everyone is always free to 'offer the Sign of Peace' to their neighbor. 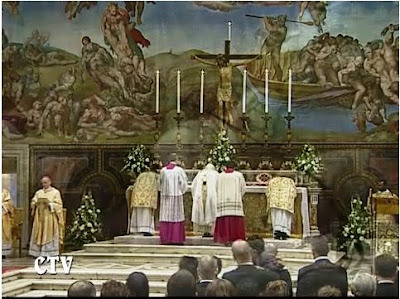 Here is the 'why' part: Like many things in the celebration of Mass in the Ordinary Form, the Sign of Peace is optional. 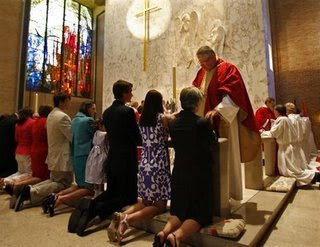 Several things are optional in 'the English Mass.' 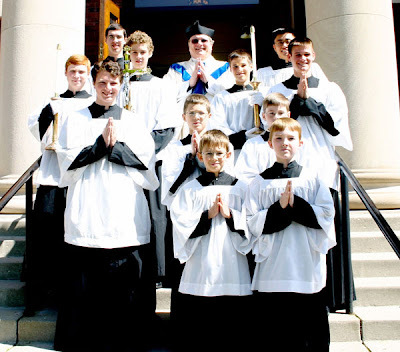 Other optional things are the ringing of the bells by the altar servers, the use of the paten at Holy Communion, girls serving as altar servers, the priest facing the congregation, extraordinary Ministers of Holy Communion, even using a language other than Latin. All of these things — and even more — are optional. They always have been. Yet, as we all know, some of these things have been pushed down our throats as if they had been the dying wishes of Christ written down by an apostolic liturgy committee on Calvary. Not so! And our current Holy Father, Benedict XVI, is finally helping us sort these things out. From the beginning of the renewal of the Sacred Liturgy, some people have simply never liked the Sign of Peace — or at least the Sign of Peace where it was placed during Mass. It’s a grand thought: making peace with our neighbors before we approach the altar for Holy Communion. 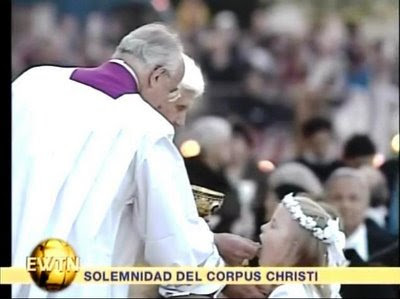 Yet, too often it turns into a free-for-all disturbing the solemnity of the moments just before receiving Holy Communion. Some people resemble politicians in heat prior to Election Day. A few people object to the Sign of Peace for health reasons. They watch their fellow worshippers cough or blow noses into their hands during Mass; then offer the same hands to shake at the Sign of Peace. In some places, where a flu or virus epidemic has been rampant diocesan officials have asked priests to eliminate the Sign of Peace for obvious reasons until health officials gave the green light. Personally, I don’t have strong feelings one way or the other. When I learned how to offer Mass in the seminary, we were taught to offer the Sign of Peace. No big deal. However, over the years, I began to see how it could get out of hand. I also began to omit it at daily Masses when the crowd was sparse and spread all over. If they were so interested in offering a sign of peace or friendship to another, I reasoned that they should have been willing to sit within twenty feet of one another. At the moment, the whole concept of the Sign of Peace and if or where it should be situated during the Mass is under study at the Vatican. They will likely make a revision. 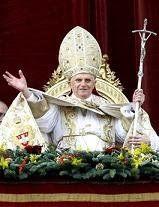 So, I thought: Heck, if the pope is not sure where and when it should be part of the Mass, who am I to worry about it? If the priest-celebrant does not say, 'Let us offer each other the Sign of Peace,' feel free to offer that sign of peace to those around you if you wish. No one says you cannot. If this causes you undue anxiety, sleepless nights, or a loss of Faith, I know a couple good therapists. I feel sorry for those reading this pastor’s letter who expected a theological treatise on the true meaning of Christmas and the Incarnation. No, it’s just the usual ramblings of the old monsignor at the Italian Parish. Please excuse his attempts at being witty. And, yes, he does have a serious thought from time to time. To all of our readers and visitors of 2008, thank you for the gift of reaching a visitor count of 15K last year. This little blog started in the midst of an Iraq deployment in 2007 with a prayer that the Lord lead us "through fire and through water" and that He did, "bringing us relief" with a return home one year ago this month. The many thousands of well-wishers and visitors of those first days were never counted and their numbers are known only to God. We praise and worship Him, who "makes all things new", and implore Him for rich blessings for all friends and visitors of MCITL in the New Year of 2009. Through the intercession of Mary, Mother of God, may Almighty God, Father, Son and Holy Spirit, bless you now and always, world without end. Amen.